A sharp decline in the number of smokers using an NHS support programme to help them quit has been linked to the rise in popularity of e-cigarettes. The Smoking Matters service in Dumfries and Galloway helped 102 people in deprived areas kick the habit in the past year - 251 below target. Public Health Consultant Dr Andrew Carnon said the trend was being mirrored across Scotland. He said many people saw e-cigarettes as a stepping stone to stopping smoking. Nationwide figures have shown a similar trend to those in the south west of Scotland. In 2013, the Information Services Division reported that the number of attempts to stop smoking had fallen by 13% compared with 2012. That was the first decrease seen in recent years and it was also suggested this could be "partly explained" by the rise in the use of e-cigarettes. Dr Carnon said that although there was still a lack of evidence about their effectiveness, the NHS might have to review and adapt its smoking cessation service in the future. However, he said he believed that there would always be a need for support services in that provision. "The position of e-cigarettes is at the moment not fully clear because they are so new there hasn't been all the research carried out," he said. "We actually don't know at this stage just how effective they are in helping people to stop smoking. "There is also a risk, potentially at least, that smokers may use them in certain settings where they are not allowed to smoke tobacco but without any intention of actually stopping smoking tobacco cigarettes." He said that was clearly a case where they would not be of any benefit to a smoker's health. "The third possibility, which again would not be a great one, is that people who don't smoke might feel that e-cigarettes are something that are much safer that they would like to try," he added. "We just don't have the research evidence at the moment to say whether there is a risk that those people who might simply be experimenting with e-cigarettes might get drawn into using tobacco cigarettes at a later stage." Dr Carnon said it was clear from research that people had the best chance of quitting with some support. "It is not just about the nicotine replacement, it is not just about use of e-cigarettes," he said. "It is actually about working with somebody to help you through the difficult process - because it's not easy to quit smoking. "So really we would encourage people either to go to the smoking cessation service which is called Smoking Matters or to one of their local pharmacies who can help them or they can ask their GP if they would like some advice." 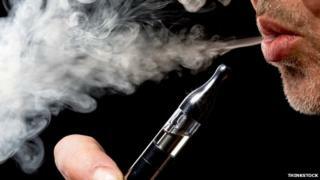 Electronic cigarettes - miracle or menace?